"Nothing in these pages is a dictate, no word says you must or you shall do it this way. On the contrary, the book sets out from the very beginning to stimulate the reader to think for himself, and to use what he has read merely as a foundation for efforts and ideas which reflect his own temperament and character. Only in this way will he obtain maximum satisfaction from the hobby of battling with model soldiers." I do like to end the blogging year with a game. The last game so far has been solo but by happy a chance I received a call from my friend Bruce who was home from Alberta visiting family. So today after several hours of chatting around the kitchen table I dragged him upstairs where I had a game laid out. Since the masking tape road and river for Blastoff Bridge was still on the table, I had hastily reset the rest of the terrain and laid out my War of 1812 armies for a Square Brigadier game, the first non-solo SB game I have played. The British line under fire early on. I had recently completed marking the middle of the 6" squares to allow them to be used as 3" squares figuring that this would allow me to use more units and give more maneuver room. By the time we finally got to it the afternoon was waning and it seemed to me that a game with 14 units aside would take too long so I reverted to the 6" squares and just made all units 2 stands strong for looks only. It turned out to be a good decision. I think it looked better and moved quickly with lots of decisive action and only a few lulls for manoeuvre and redeployment. Each side had 7 units and 2 commanders. 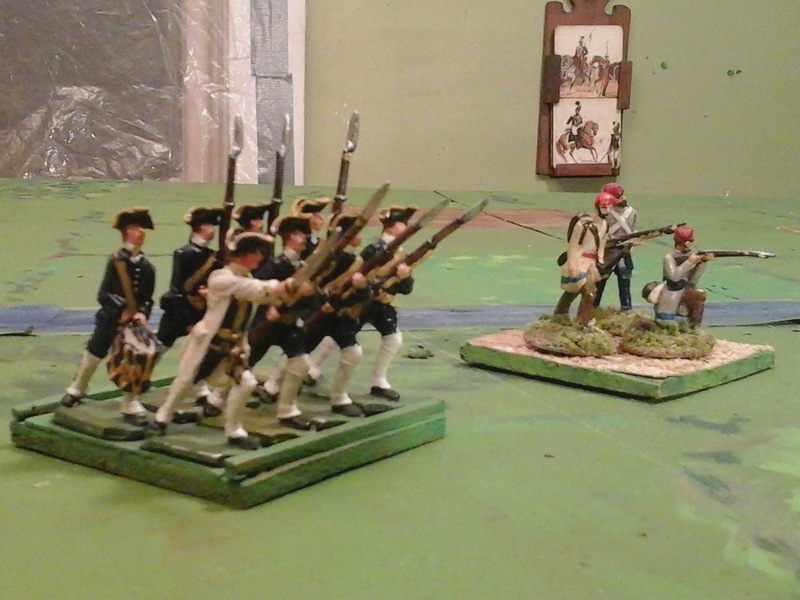 The British had a battery, 2 light infantry and 4 infantry. The Americans had a battery, a squadron of Dragoons, 1 unit of Riflemen and 4 infantry. The US had the mission of destroying the bridge. Bruce chose the Americans, largely I think because he was already sitting there while we chatted about wargaming and mutual friends. The first side to lose 4 units would lose otherwise victory was decided on whether the US could blow the bridge or at least hold one end at the end of the game. I sent two units across the river to attack the farm while the rest marched forward with all speed and deployed to attack the bridge. Bruce quickly moved to occupy the farm, sending 1 lone unit across the river as a vague threat and massed the rest of his army around the farm and bridge. Firing breaks out. Note the sneaky NY Dragoons lurking behind the farm. In a few turns they would sneak down the table edge and then take advantage of a flip in initiative to make a double move and charge into the rear of my British infantry before they could react. The firing was soon hot and having lost a brigadier while trying to steady the troops my infantry was driven back. Bruce decided to send his cavalry around my flank and with a sudden flip of initiative he was able to charge into my flank before I could rally and face him. He then proceeded to roll up and wipe out the 104th. My light infantry were caught in a pincer between a charge by the Lafeyette Volunteers and the pursuing Dragoons behind them. Having already taken losses from the riflemen they were easily over run. I was now 1/2 way to my break point and out of position. In the centre a fierce firefight raged for several turns before I managed to silence his battery and drive his infantry back. I felt uneasy at doing it but crossed over my infantry and started moving up supports. A possibly rash charge by the now tired Dragoons ended with the loss of the Dragoons and their accompanying Brigadier. A chance card now allowed me to shake loose his reserve infantry unit threatening my flank. I was hoping it would retreat but rolled an unordered advance to the middle of no where. I expanded the bridgehead, opened with cannister on the stray infantry unit and was starting to relax when another initiative flip resulted in a sudden resurgence of Blue infantry. Swinging his unit around to fire across the river into my flank he attacked from two sides and destroyed my Glengarry Light Infantry. I was now down 3 units against his 2 losses. Cannister drove one American unit back and some unusually effective musketry routed another battered regiment and shot down his Brigadier. The game turned on a thread, next loss to either side would end the game otherwise the end was 5 turns away. and I no longer held both sides of the bridge. The next turn was indecisive but at last I sent in the Fusiliers supported by the 89th. Either or both sides could lose but the Fusiliers came through for me. Mid game, the British have lost more units and leaders but the remaining American units are in worse shape. All is yet to be lost or won. Here ends the year. A look ahead will be next. MAY 2017 BRING JOY AND GOOD FORTUNE TO YOU ALL. Born and raised in the suburbs of Montreal, 5 years in the Black Watch of Canada Cadets, 5 years at the Collège militaire royal de Saint-Jean followed by 4 in the navy. 25 years with CPC in IT simultaneous with 23 years running a boarding kennel. 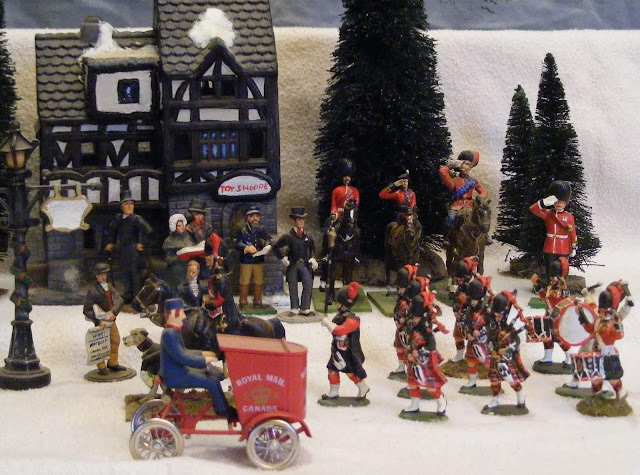 Inherited my love of toy soldiers from my mother's father. Married with a pack of Italian Greyhounds and 3 cats. Prematurely retired and enjoying leisure to game, maintaining our 160 yr old farmhouse and just living. Today I ventured down into the Valley to meet a couple of friends for a Boxing Day wargame. 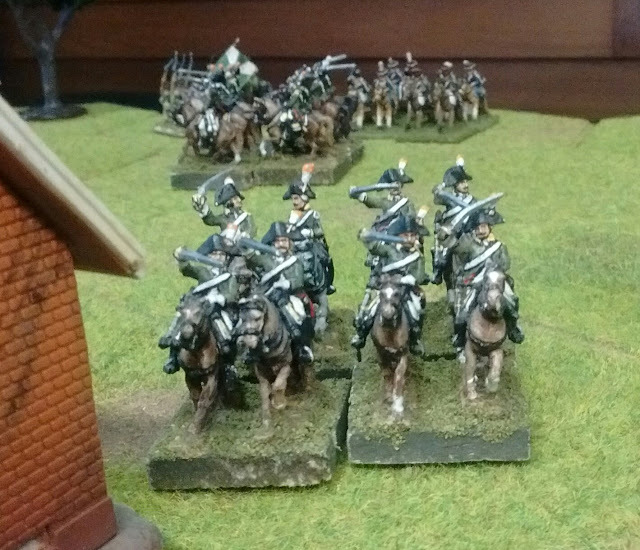 A few of my old 15mm Condé's Legion Dragoons now doing their part in Jeff's Napoleonic army. Today's game was a 4 player Epic C&C Napoleonic game. We had various levels of expertise with the rules and we kludged a few things to convert an 8 player game down to 4 but it was a fun gaming day. Jeff, Brent and Zack laying out. Who won you ask? Why would that matter? Let's just say that the Russian army ably commanded by Brent seconded by yours truly, fought bravely and well and died where they stood. What more could one ask of them? Next post, a look at the new French moulds followed later by a final solo game of the year. So much for a pre-Christmas game. Most of what hobby time I've managed has been spent reading, thinking about game mechanics, unit organization, basing, fortress construction etc while trying not to contemplate the irationality of having two separate semi-flat, not completely historical, 18th Century armies, both at least half in French uniforms. 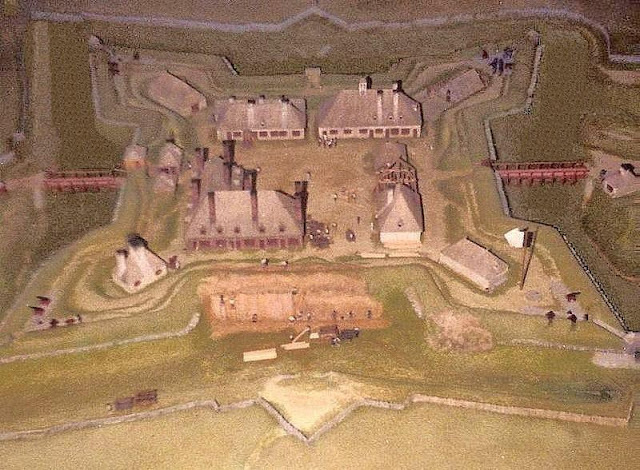 What the photos of the new French moulds had suggested to me was historical scenarios based on the siege of Fort Beausejour and the two sieges of Louisbourg, including some minor what if's such as historically possible reinforcements actually arriving along with replacing a few incompetent and/or timid French commanders. the more sense it made to stick with last year's plan to incorporate some bits of Acadia and Quebec into my NQSYW. I struggled, I held firm for a while but the walls started to crumble a bit, and I have hung out the white flag. 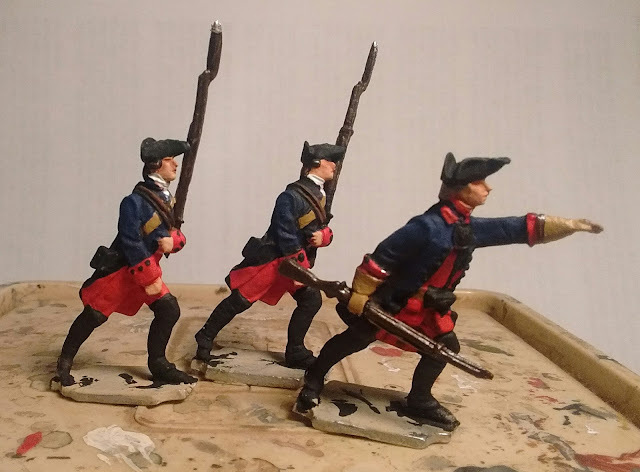 While waiting for Christmas, I found some Austrian castings and have started making a new Rosmark Provincial Regiment. So the new troops and the planned sieges, amphibious assaults, ships etc will shift to the wild northeastern frontier of Rosmark. Long ago the Maritime or Rebel provinces had founded colonies along the far shores of the Northern Sea and forged alliances with the wild native peoples who inhabited the woods and rivers of that wild land. Rosmark, however, needs resources if she is to stand alone against the growing armies of the various Kingdoms, Free Cities and other states to the south and west. With this in mind, Rosmark has begun to push east along the great rivers and found its own colonies along the shores of the northern sea and has declared suzerainty over the whole area as being part of the old Queen's Dowry. The colonists have called on the Rebel Provinces to help them resist these claims. More Imagining, Planning and Experimenting. The ships were what was bothering me most. A "serious" approach might include off table ships for 40mm amphibious operations with fleets of 1:1200 ships for sea battles but the toy soldier approach really calls for fleets of bathtubbed toy ships that can sail on table and carry 40mm landing parties. I had temporarily forgotten that I had a start on just such a fleet. 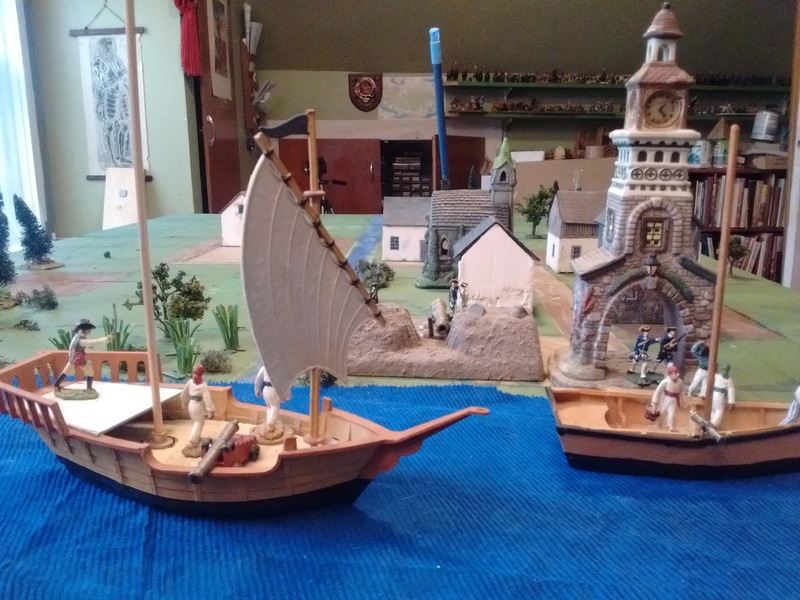 A quick mock-up of a small Acadian village with a rather grandiose clock tower, and a cutter and an armed brigantine. You say 'toy pirate ship', I say 'Brig'. Of course, I need to get a few more and then complete some renovations, make or find some naval guns etc., but it looks promising. The pirate ship is a recast of the old MPC one. I found an affordable deal on a pack with three of the small ones like the one above and one of the big ones. Hopefully it'll still be available when the war funds get renewed. If only the Barzso naval cannon weren't OOP but I should be able to build naval carriages and use PA barrels as 8 lbers and eventually 12pdrs. These are mostly privateers anyway, not ships of the line. 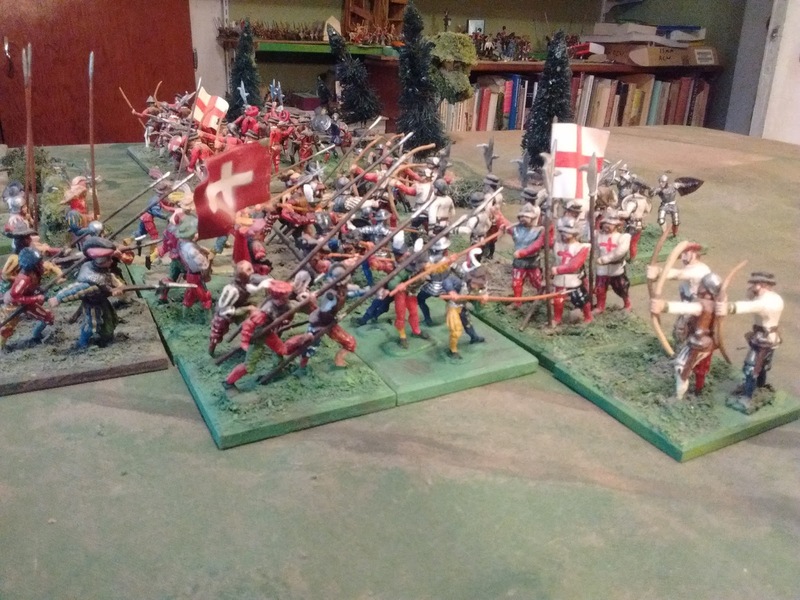 Along the same lines, I've been contemplating the size of the armies and games and decided to stick with the sort of looks right and works approach urged by Lawford & Young and by Duffy. For me this will mean a vaguely 1:5 ratio with company sized units of 8 with most games having less than 100 figures per side but with perhaps 3 companies per bathtubbed battalion at 1:15 for the biggest envisaged battles with up to 200 figures on the largest side. I've had to scrap the 8 figure bases though since I will have to split my units to provide outposts, sentries, landing barge complements, wagon escorts etc. Since I want to keep the footprint per figure small, too small for stability, I won't go back to single figures on washers but instead will go with 2 figures on a 30mm*30mm base as the smallest individual detachment. These can then be grouped into larger formations as required, possibly on movement trays. It also occured to me today when I did a trial layout of a town that I'm going to have to plot out my opposing towns, including surrounding terrain, so that I can lay them out the same each time. The grid should help with that. 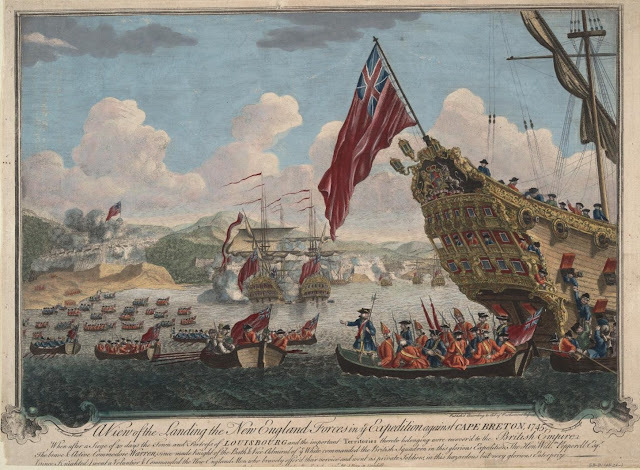 Not surprisingly, the early military history of Nova Scotia/Acadia (click) is not well known. What I basically remember from school in Montreal was that after some disagreement in the 17th Century about whether this was Nova Scotia or Acadia, the French built Louisbourg so that Wolfe could come and capture it before moving on to take Quebec bringing us back to 'real' Canadian history. So it was a surprise later on to hear that Fort Anne in Annapolis Royal in Nova Scotia was attacked more often than any other fort in North America (something like 13 times over a period of less than a century). Why? By whom? Anything worthy of a wargame? 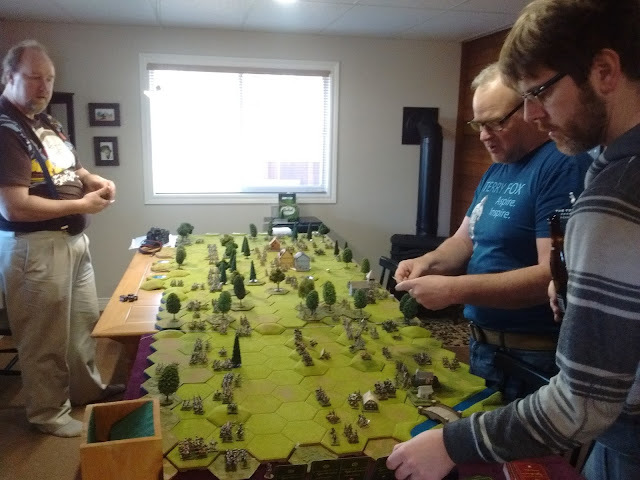 A brief glance at the details of those 150 years suggests that there is ample scope for wargaming just not for conventional miniature wargaming. There were no pitched battles between conventional armies and the sort of terrorist warfare that plagued North American history during the conquest holds no interest for me as a source of amusement. What there were in plenty were sieges, mostly small apart from the two sieges of Louisbourg and usually seaborne due to the difficulty of transporting artillery and regular troops over land and the ease with which any point of interest could be reached by sea. I have occasionally been tempted by the thought of staging a mini-skirmish level 17th Century land and sea mini campaign involving Fort La Tour, some ships, pike and shot Europeans on both sides as well as some Indian allies but since the driving point is the new Prince August Seven Years War moulds, I will once again put that temptation aside. A scene from a test of the Fire & Stone siege rules using a mock-up fort. A model Fort Anne or Port Royal as it was called when the French first built it. Planning continues for this winter's campaign season. This release from Prince August came earlier than expected but with a limited time free postage offer on top of a package discount, well it would have seemed just rude not to buy. Besides the spare heads include bareheads and forage caps and the coats without turnbacks will serve nicely for urban militia as well as for British, French and New England troops in inclement weather. Coming soon to a mailbox near me. For a few minutes the sight of all those French regulars had me thinking of the Plains of Abraham not to mention Minden etc. especially as I don't really want to do more single figure skirmishes. However, I soon managed to come back to my senses and stick with the Acadian theatre of King George's War in the 1740's. Of course the original affair mostly consisted of the sieges of Fort Anne and Louisburg and the missed opportunity that was the disastrous expedition of the Duc d'Anville along with various minor skirmishes. The 1st Siege of Louisburg has potential as a mini campaign but it would be hard to represent on my table and anyway we know how that ended. Something the size of Fort Anne would be more reasonable if we buggered the history enough to allow something like the planned attack rather than the weak investment that was managed largely by the Canadian expedition while the French fleet and army waffled and died of plague in Bedford Basin. But, as long as we are messing with history, it would be just as easy to imagine two forts with adequate forces and bold commanders. Now there is scope for amphibious landings, ambushes, sieges and assaults. The primary forces will be New Englanders and Compagnies Franches (not the Canadian, frontier irregular types, the ones stationed at Louisburg were ordinary regulars straight from France). These will however be backed by French and British regulars, landing parties of sailors and marines from the fleets, woodswise Acadian militia and urban Louisbourg militia, indians, rangers and possibly a contingent of veteran Canadian woods fighters both militia and Compangies Franches under de Ramezay. The tentative plan is for companies of 3 skirmishers or 8 infantry fixed to 6cm bases as individual units that may be grouped. So on this front at least, it'll be more about casting and painting than playing this winter but I'm looking forward to the whole affair. At last today I was able to sit down for two hours and play this game through. The previous days' bits and pieces of free time were not lost though as I sorted through the figures on hand and reviewed three years worth of late 19thC/early 20thC game reports on various grid sizes using various versions of the rules and various organizations. I also contemplated how various scenarios would work with each system and cross referenced all this with what I really want the games to feel like. The end result was to fall back on the organization of battalions composed of 4 stands each of 2 infantry which I selected back in the fall of 2014 because the originally planned 16 man battalions were more figures than I wanted to paint and more than I had room for. This organization got lost when I started trying to cram everything into smaller squares on a smaller table. There are other very viable options for the bigger squares and I considered some but the 4x2 was the one that I liked best and wanted to make work. So I did. A rough quick reference version of the rules is available (click) but I need to expand it to a full explanation of how my troops are organized and how things work as well as by adding all the extras such as field hospitals, boats and so on. Unlike earlier versions I am just going to lay out what I do but anyone who wishes to is free to borrow or adapt to suit themselves. The rules will be an example of my new 'sweet spot' a cross between a "serious" traditional historical wargame and playing with toy soldiers. Early in the game. The Royal forces have seized the bridge and are attacking up the West Bank while the Republican forces are advancing cautiously. The game was essentially Blasthof Bridge, the introductory example wargame from Lawford & Young's Charge! or How to Play Wargames. The Red Queen of Faraway's army stood in for the Imperial army while the Republic of Oberhilse's army took the role of the Elector's force. I made no conscious attempt to follow the original plans or to program either side. The only change to the army lists apart from grouping the figures into 8 figure infantry battalions and 4 figure cavalry squadrons was to reduce the artillery to 1 gun aside. That was due as much to a shortage of artillery pieces for the late 19th Century as to a concern that the force was too small to warrant 2 batteries. The infantry were all armed with breechloaders, the cavalry all carried carbines for dismounted work as well as swords and lances. Having a cavalry advantage, General Milne split his cavalry and rapidly seized both ends of the bridge and then concentrated on the West bank as soon as his infantry was up. 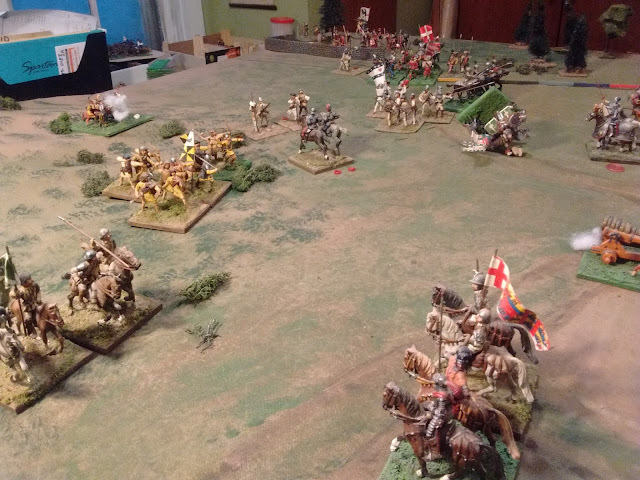 He then split his infantry and set up a defensive line screened by a brief spoiling attack by part of his cavalry. His explanations of why he felt that move was necessary and whether or not he felt that the damage to his cavalry nearly lost him the battle have never been properly answered. General Zinn began by sending a screening party of infantry over the river and concentrated the rest of his force for a push up the West bank. He soon found himself channeled by the steep hill which made it difficult to exploit his numbers. Once his cavalry and gun had thrown back the Royal cavalry and the battle began to settle into a desultory long range firefight, he decided to transfer half of his infantry to the other side to launch a coordinated assault up the East bank. The Red Queen's men have been thrown back and only a bold advance by the last fresh squadron of lancers has plugged the gap. Across the river though, the Republican losses have been heavy and their last chance to seize the bridge will be a desperate assault by a battered battalion of the Blue Guard. On the East bank there was again a funnel, this time though the farm full of riflemen was more of a threat than the hill crowned by a squadron of dismounted cavalry had been. Every attempt to organize a concentrated attack was shot apart before it got started, a situation not helped by some timely chance cards in the enemy's favour. In the end he was forced to lead the last assault and risk all. For a minute the redcoats wavered and Colonel Marten was forced to risk the bullets to steady his men and bring up reserves. Across the river the slow dribble of casualties finally broke the back of the Queen's cavalry but the Republican cavalry was too badly shot up to take advantage of the situation. It was now or never, the last attack went forward and was shattered, General Zinn rallied them but then the 4.7 shells came crashing in and both the Blue Guard and 7th Infantry fell below 1/2 strength while Red's infantry still had 2 fresh battalions. It was time to retreat. Turn 12 and a despite General's Zinn personal intervention the Republican army is shattered and must withdraw leaving the Royal Army in possession of the bridge. This is the sort of game that these armies, and my WW1 and Colonial ones were designed to play and the sort that I was getting sorted when I decided that I had to shrink my table a year ago. I'm glad they're back. Now I can start work healing the damage done to the armies in my search for a smaller foot print and get ready for some winter campaigning, everything from a train ambush to a pitched battle are possible again. The refurbished table isn't finished yet but its far enough along to be played on and I'm ready for a game. The armies of the Blue Republic and the Red Queen are about to clash over the Belmont bridge. We'll see when the game is played but so far it feels very good to have my big squares back! After some waffling the re-re-re-inaugural game will be set in Atlantica in the opening years of the 20th Century. A nice simple meeting engagement, based on a well known scenario, one of the first I ever read, one which has never failed me yet. I took a few minutes to update the Tin Army and to reinstate a few rules that only work when the squares have room for two infantry units. The result can be accessed from this link: The Tin Army. Game to follow as soon as I can get away with it. I suspect Saturday with a Sunday morning report. At last winter weather is upon us. Two more weeks and the winter break/campaign season wull begin in earnest. In preparation I have been borrowing, if not downright stealing, time to begin by clearing for action. The last year and a half has been one of turmoil for my gaming room as I have attempted to use it for more. This has been most obvious in the shrinking tabletop leading to explorations of how to get the most out of the smallest convenient space, and by a sea of seemingly unclearable clutter which has impeded me at every turn. There comes a time when one must recognize and accept defeat and start to deal with the consequences and search for a new plan. The taking apart has been done, things have been "disappeared" and now begins the reconstruction. Experimentation has shown that the less cluttered room could once again house a 5*8 table should I be willing to bump into it constantly but a 4*6 will now fit easily without being in the way. On the surface this will make the table slightly bigger but since I have learned a lot about the pleasure and possibilities of small games I am also going to decrease the number of grid squares thus making the table smaller on the inside ,(a sort of anti-TARDIS?). The main benefit of going back to 6" squares is merely looks, the larger squares make it easier to fit troops and terrain in together and easier to improve the look, something I'm looking forward to after all this improvisong and experimenting. Last week was another hectic 'winter is coming ' sort of week leaving little time and energy for hobbies so any comments or conclusions may be even less cohesive than usual. Mercenary pikemen in French pay clash with old fashioned English bills and bows c1548. If I remember correctly my aim had been to play a wargame that felt a bit more like a traditional wargame while also turning my mind to the thorny issue of the relationship between historical command and control and game mechanisms. Rather than spend a lot of effort on scenario design or pick one of my usual teasers, I just threw the painted cloth (game mat I suppose in modern parlance) on the table and let it suggest something. That something ended up with one force trying to deny passage along a road through a gap between woods and some broken high ground. When I turned to pick armies my eye fell on my 16thC Anglo-Scottish wars figures and the game was soon good to go. Battle rages across the board. Among the C&C mechanisms that I considered were written game orders as in WRG 3rd edition Ancients, fixed, predefined orders as used in various rules, a variation on DBA's PIPs, diced activation, variable length moves with in command bonus, card draw activation by subordinate command, a couple of others and various combinations. I changed the system mid game and even mid turn and restarted the game twice before essentially giving up and thus finding the best feel yet. The answer of course, which I should have known by now, was to stop trying to mimic historical processes in favour of getting appropriate results and to stop worrying about inventing "game like" mechanisms for their own sake unless I wanted to make that my focus, which I don't. A last desperate charge by English heavy cavalry is repulsed and the Earl of Belmont is wounded. The English yield the field but it was nip and tuck. I went back today and reread some of my own thoughts on control vs fiction from an August 2010 post (Control vs Friction) and that post still holds true. However that in turn reminded me of Frank Chadwick's design notes from Volley and Bayonet (linked page removed) which resonate with me even more now than they did then. Now to apply this sort of thinking to the mid-ninteenth century. BTW, next time I think that I should ponder about making a wargame more "game like" I must remind myself that Chess is also a game. Gathering of Host. Medieval Fantasy campaign and rules blog. A few games over the Easter weekend. L is for Lone Wabbit and Egg: Bunny Cart at the River Styx! The War of Spanish Succession... British First Foot Guards. Figures from Miniature Wargames 29. New Christmas Decorations moulds for Xmas 2018. KEV's FIRST HORNBY 'OO' LAYOUT. More rules, less progress, but finally more landsers. Painting Some of the Backlog! 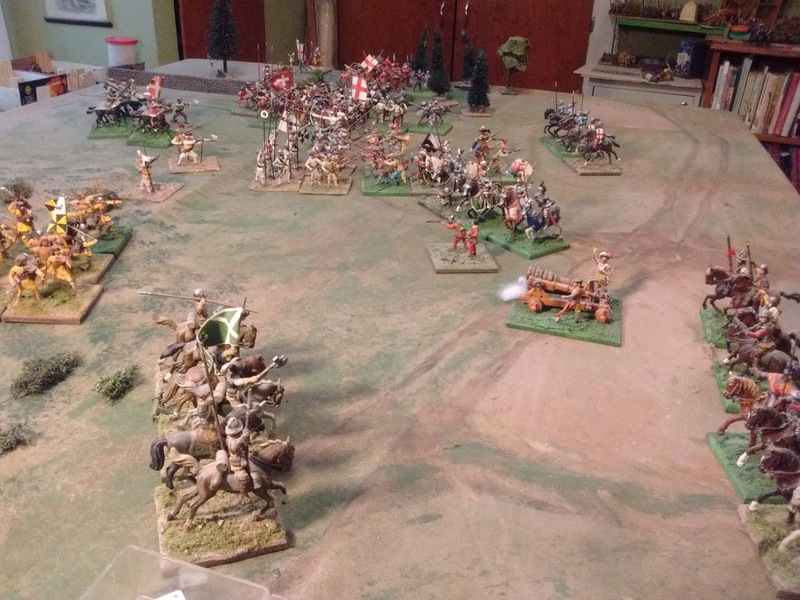 Pavilioned in splendour- wargaming with ancients..
Grand Plan for "Stagonian Wars"
A Method For Using Military Images - Part 5: Cuneo and "Artful Armies, Beautiful Battles"
"The Gatling's Jammed and the Colonel's Dead – – -" – Because games are supposed to be fun! Some of the Labels. Use the search or archive to find other posts.